No question about it. 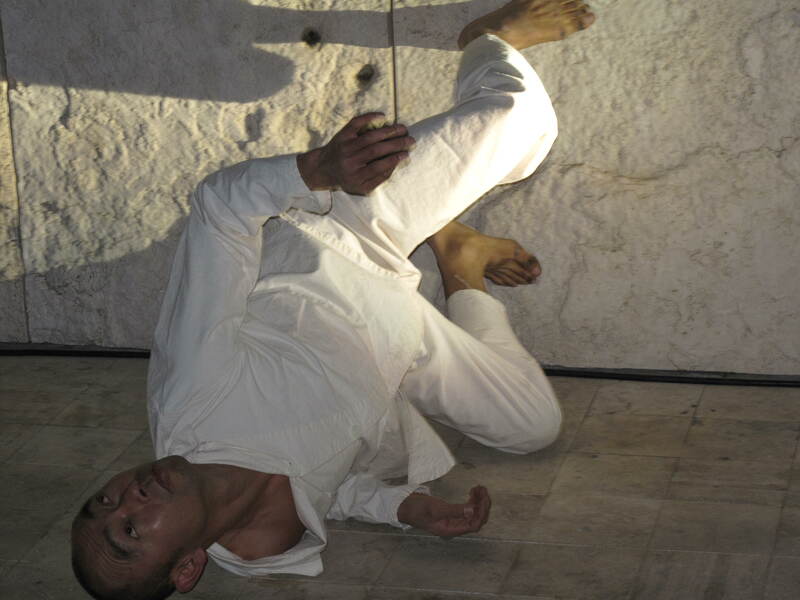 Butoh master Oguri is one of the most incredible performers I’ve ever seen. 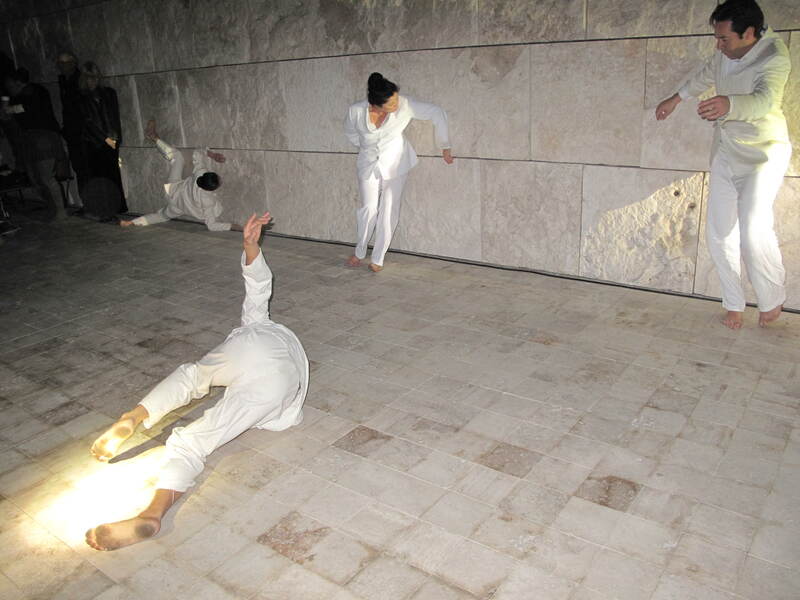 So when I heard Oguri would be dancing in Hirokazu Kosaka’s site-specific performance Kalpa at the Getty Center, I rushed to get a reservation before it sold-out. 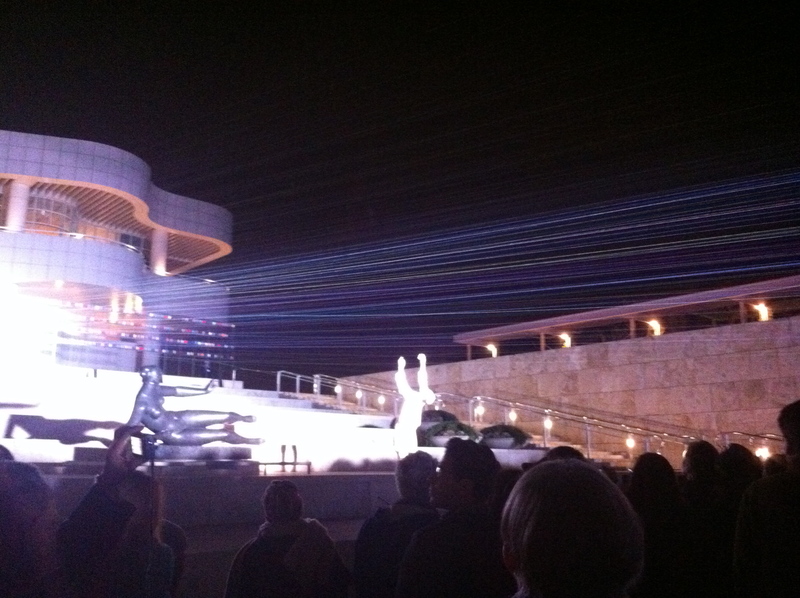 Kalpa was definitely the main event for the Getty’s kick-off Pacific Standard Time (PST) Performance and Public Art Festival last Friday. 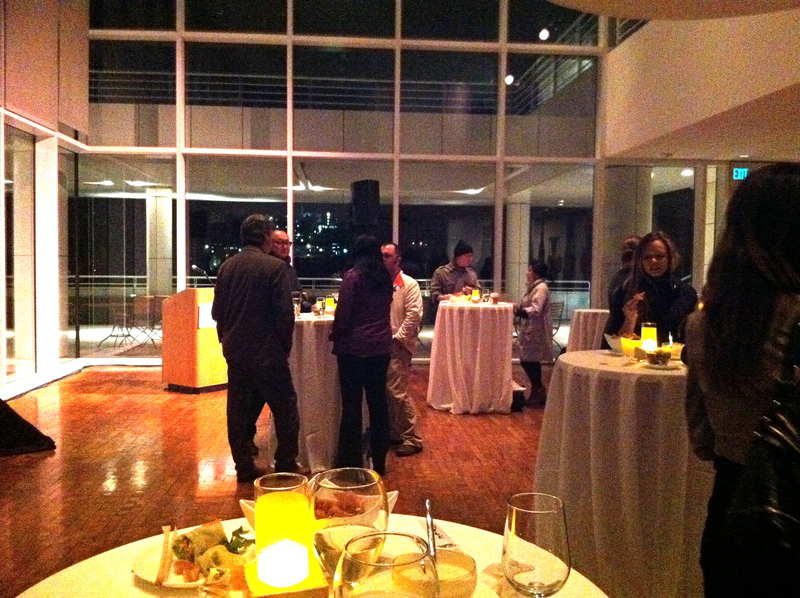 But there was also a private VIP/Press event that night, and I was lucky enough to get a last minute invitation. Here’s a behind the scenes rundown of our evening. 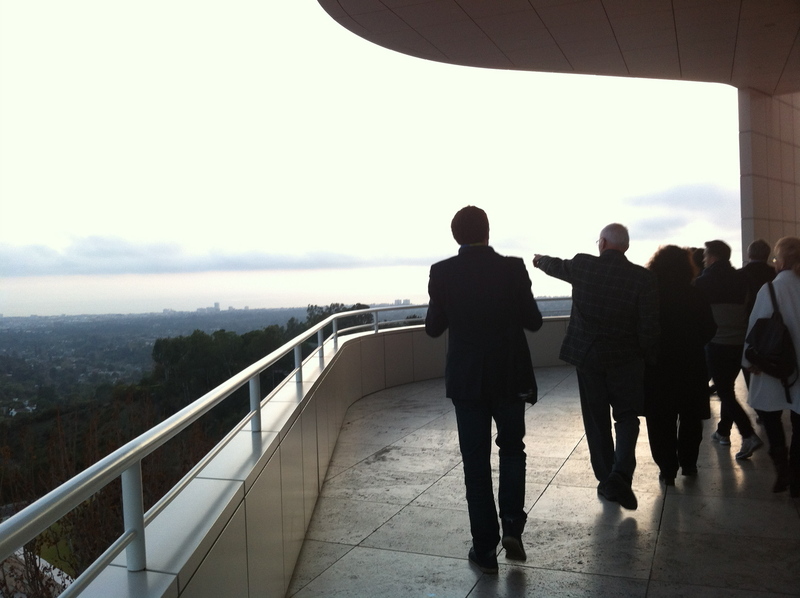 We arrive at the Getty Center. 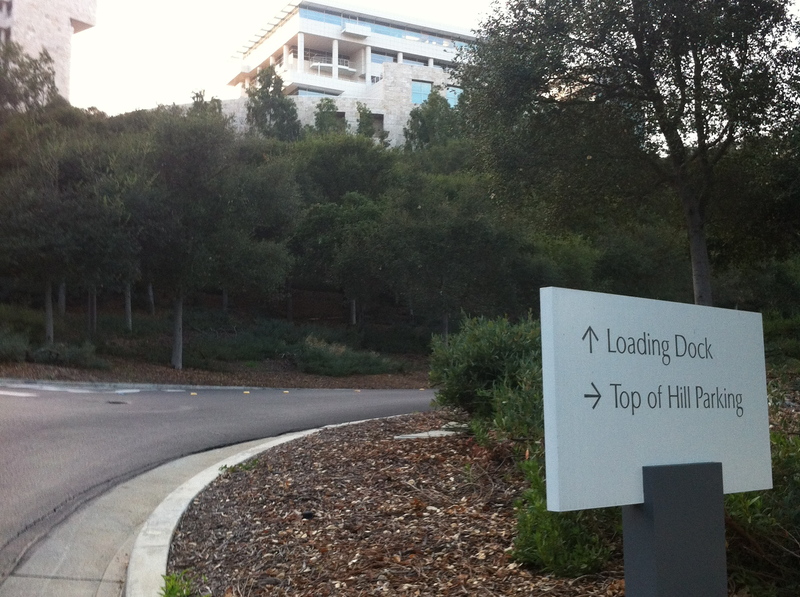 My husband and I follow the instructions on our invitation and check-in at the private back gate of the Getty Center. 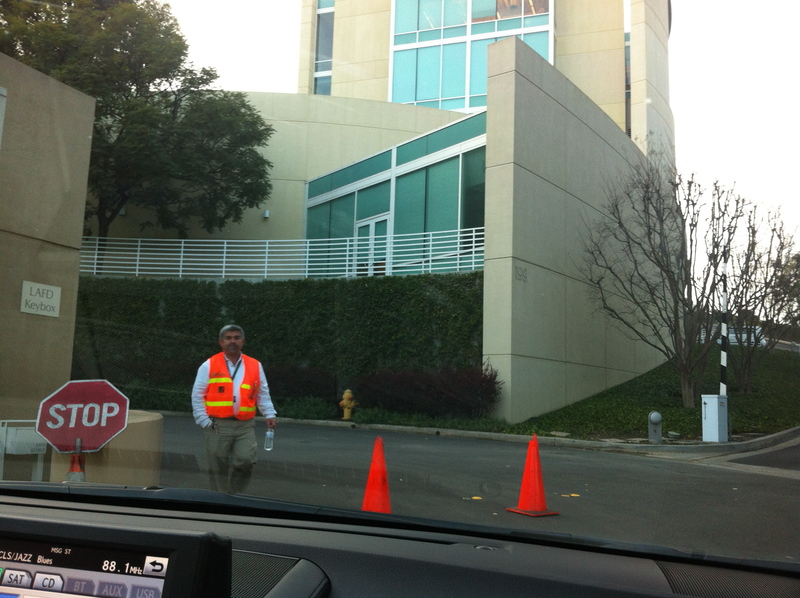 No tram for us tonight, we’re told we can park at the top of the hill…I could really get used to this. We meet in the museum lobby for a private walk-through of the Getty’s PST exhibition Crosscurrents in L.A. Painting and Sculpture, 1950-1970. Curator/GRI deputy director Andrew Perchuk leads the tour – I find out later that he played a major role in the PST research initiative. First stop, Robert Irwin’s PST Black and White (2011) installation. 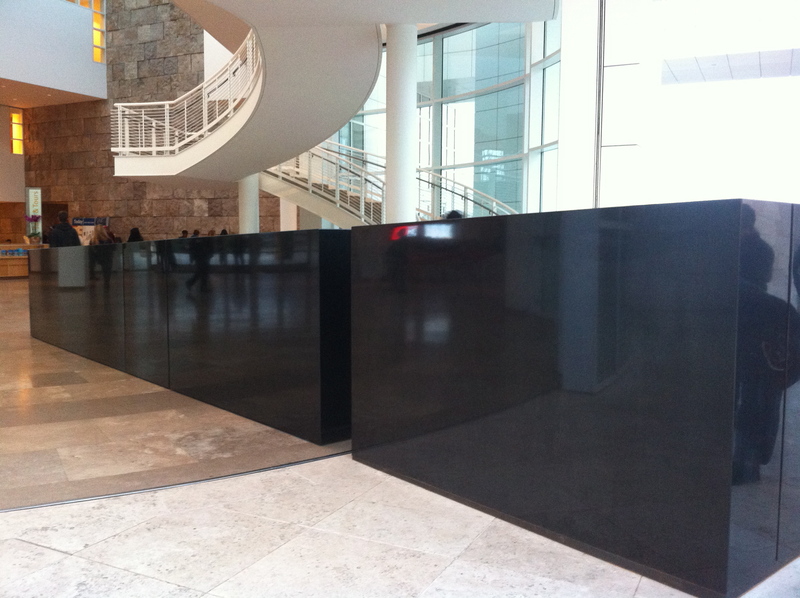 Irwin crafted this piece from 40,000 lbs of Indian granite, one of the world’s finest. Perchuk tells us Irwin’s installation was nothing less than an engineering feat tackling questions like, how do you keep the sheer weight of it from falling through the floor, and how do you get the lobby’s 8,000 lb glass door to pass smoothly through the middle so that it can close, which the door does miraculously every night. 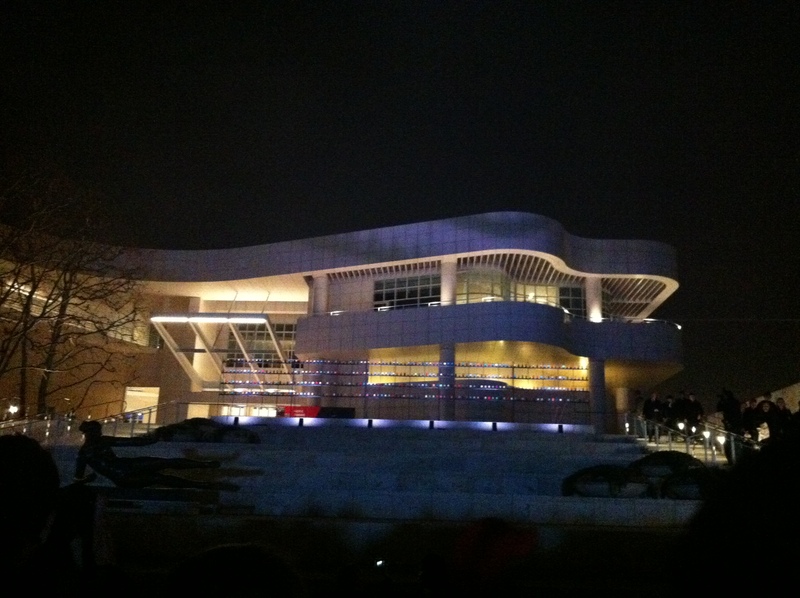 Next, we head up to the Crosscurrents exhibition galleries. No photos allowed inside the exhibition, but I can tell you there are some great works of art in the show. We’re talking works by Hockney, Ruscha, Diebenkorn, but also equally stunning works by lesser known artists central to the post-war L.A. art scene. And it’s the discovery of these lesser-known artists that makes the PST exhibitions I’ve seen so memorable. We get our coats and follow everyone to the arrival plaza. On the way down, we check out 400 spools of colored thread at the top of the stairs. We’re told they will be part of the Kalpa performance. We wonder how. We stand at the bottom of the museum steps waiting for Kalpa to begin. The plaza is packed with people, and there’s a definite buzz of anticipation in the air. We realize a Butoh dancer dressed all in white has emerged from the tram platform. We turn around and follow the spotlight to get a closer look. 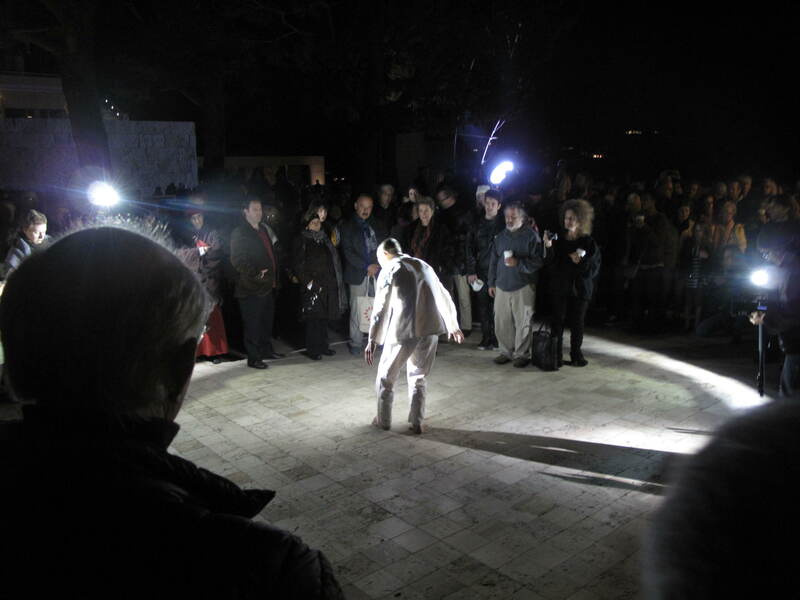 Through the parted crowd we see Butoh master Oguri eerily making his way across the arrival plaza. The audience, myself included, clamors to capture the performance with their digital cameras and smart phones. But capturing the moment with a camera is truly a futile exercise. Yuval Ron’s electronic soundscape, the blaring spotlight cutting through the darkness, the chilly night air, and the confusion caused by the performers unknown path through the crowd, creates a visceral experience that is all too fleeting. The dancers slow methodical movements must be witnessed live. At times it seems as if they are floating on air. Other times, they seem to defy gravity by walking on the travertine walls. 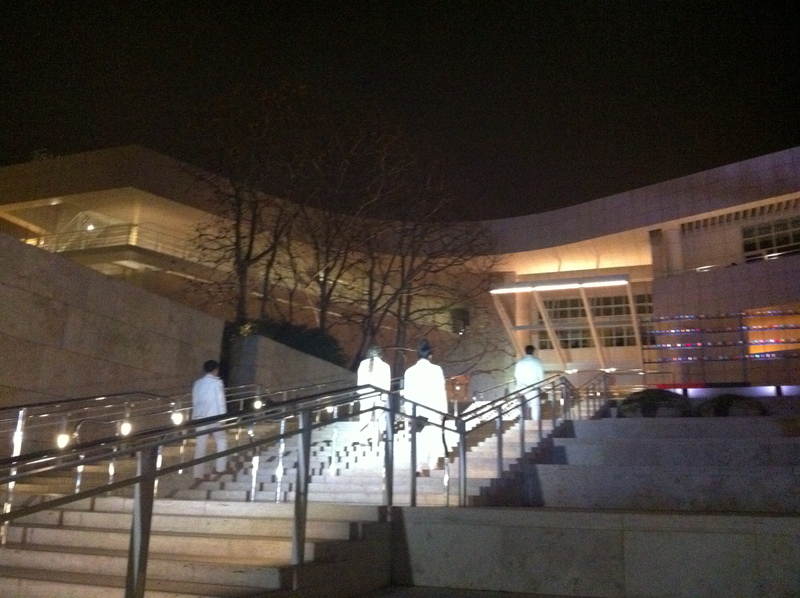 They make their way toward the thread spools at the top of the museum stairs. On their descent, we see that the performers have thread strands harnessed through their mouths like bridle reigns as they head our way. Eventually the threads hover above the crowd extending to the spotlight at end of the plaza. 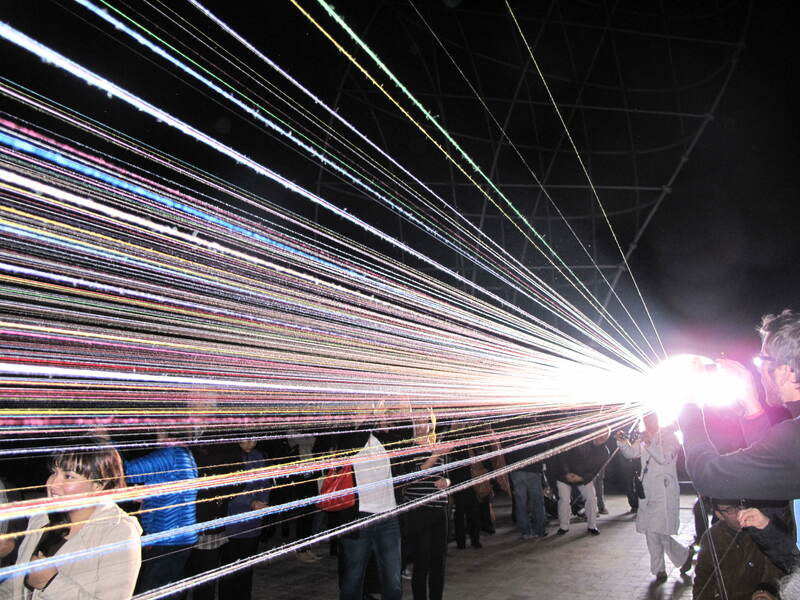 The spotlight electrifies the brilliant colors of the threads. Oguri stands alone at the end of the piece. The arrival plaza after the performance and the crowd departs. Postscript: If you missed Kalpa, there are still lots of PST performances this week (see schedule). 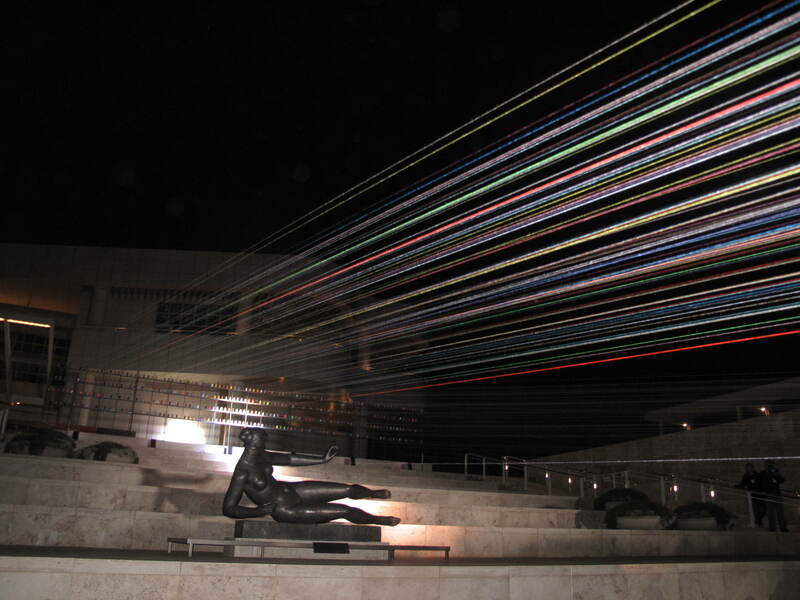 Also, a reminder that the Getty’s PST Crosscurrents exhibition closes February 5. So be sure to see it soon. 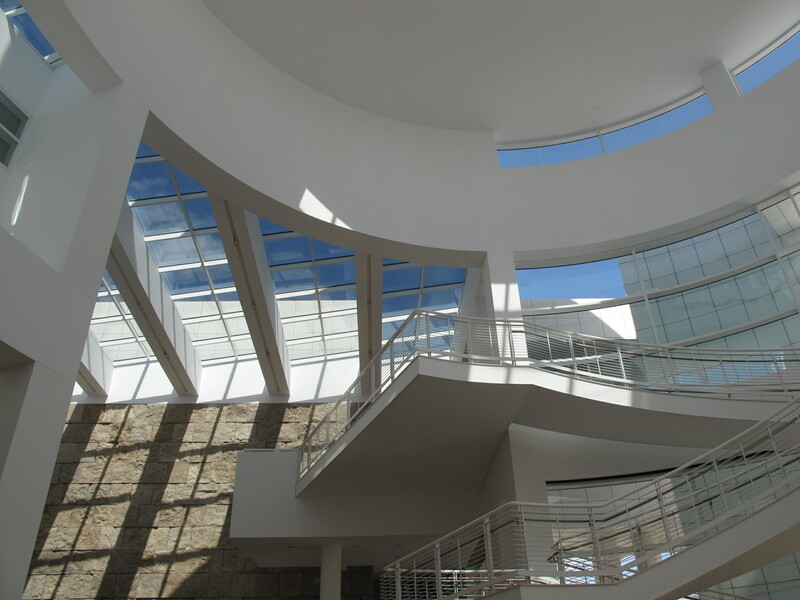 Stayed tuned for more upcoming posts on PST exhibitions and events. Wonderful coverage of the whole evening – I wasn’t able to make the tour but we must have been near each other for most of Kalpa because I have some pictures that are almost identical (just loaded them on my blog today)! Unfortunately I ended up watching much of the performance through other people’s cell phone screens….